A couple of days back, we came across what appears to be a successor to the Galaxy Tab A 10.1 on the Bluetooth SIG website. The same device has now been spotted at the Wi-Fi Alliance undergoing Wi-Fi certification. Though not much is known about this device, the series of certifications confirm that the official launch is around the corner. 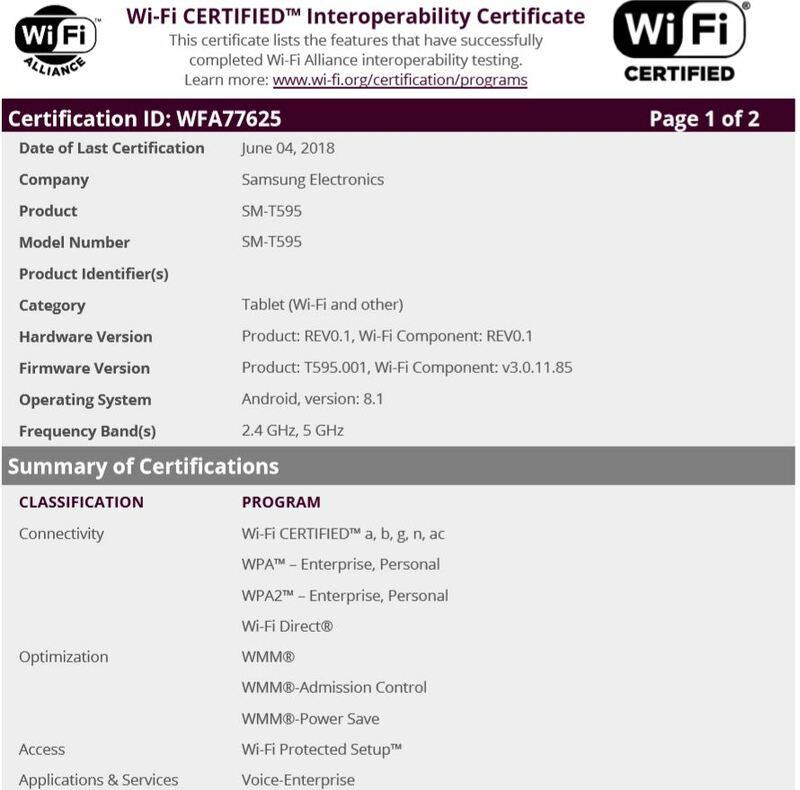 Going by the documentation on the Wi-Fi Alliance website, the Galaxy Tab A 10.1 (2018) will come with Android Oreo 8.1 onboard. If the launch indeed happens in the near future, then it may be the first Galaxy device to run Android 8.1 out of the box. Strangely, no concrete information is available about the specifications of the device yet. However, since the previous model was a mid-range tablet, the same may be true for the 2018 version as well. To clarify, we are calling this a successor to the original Galaxy Tab A 10.1 based on its model number SM-T595. The 2016 version launched with the model numbers SM-T580 and SM-T585 for the Wi-Fi and LTE variants respectively. If Samsung is sticking to the pattern, then the SM-T595 is an LTE variant of the 2018 model. Interestingly, the Bluetooth listing mentions the product name for SM-T595 as the Galaxy Tab A2 XL. Whether it is merely an expanded codename for gta2xl used as a placeholder or a new moniker will be known at the time of the announcement.